Tiaras, Tantrums & Martinis: Oh TOODLES.....Where's My Wine? Parenting -although beautiful and lovely - can be very...well, monotonous. It's the exact same thing every day - day in and day out. Same routine... same arguments ("Mom, Ben pulled the legs off my Barbies! "), same requests ("Mama, I need goldfish...I'm thirsty, I want to fly in outer space, Can I have a princess dress? Can me have another strawberry?") same TV shows (Mickey Mouse Clubhouse - on a sidenote - where the hell is Toodles when I need a refill on my wine??) , same things for breakfast - every single day. It's kind of like that movie "Groundhog Day" with Bill Murray. By day 73, you want to mix things up a little...see if you can't change the course of the day by getting a little crazy and changing the order of the morning routine. Brushing teeth BEFORE letting the dog out or trying something different for breakfast?? Nah, all that accomplished was a mastiff whining at me while I brushed my teeth and 2 unhappy kids who wanted nothing to do with scrambled eggs - which the dog ultimately got in the end anyway. Yes, ask and you shall receive. Want some excitement? 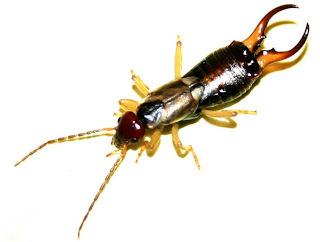 Here's an earwig bite to really rock your universe. Apparently, you really have to be more specific when asking life to shake up your routine. Anyway, besides being really skeeved out, I managed to survive the Earwig episode of '13 with nothing more than little pincher marks on my arm. So rude! Who DOES that?! Sometimes we just have to create our own fun. 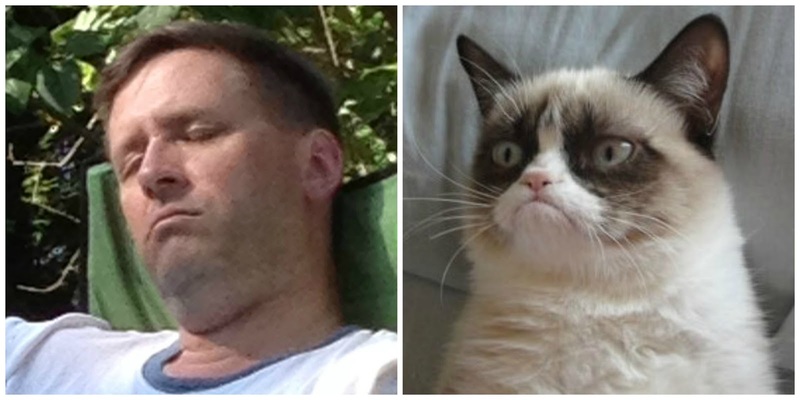 For example, Brian fell asleep in a lawn chair last weekend and I decided he bore a striking resemblance to Grumpy Cat - so here's a little side by side comparison. Yes, Brian gave me permission to post this :) He's a good sport. Plus it's really funny...and the kids have been getting a kick out of calling him Grumpy Daddy. The thing with parenting is that you're stuck in this little routine, and then all of a sudden, the whole thing changes and your stuck in a new and different routine. Just when you think you've mastered this one stage - things do change. It's sometimes easy to lose sight of the big picture when you're in the day to day grind, but looking back - things really have changed quite a bit. My kids (4 and 3) are now so much more independent...they have such active imaginations and play together very well. It used to be that they were amused to play with toys and books in our playroom...my job was to keep them safe and nurtured. Now they want to be out on adventures everyday. Each morning they ask where we're going that day. My biggest challenge is finding new and exciting adventures while balancing housework, grocery shopping, and of course the checkbook. It's hard to convince them that we're going on yet another adventure to the grocery store. The other day I was taking them to the library to check out some books and Lauren informed me that we've already been to this library, so let's try and new one. I also took them to their first movie the other day and they did great. I thought they'd be scared of how loud it was, but they loved it. Anyway, as I write this I realize that Lauren will be going to preschool in the fall and the routine will completely change again. Ben will miss her terribly, and I'll probably miss their little arguments over dismantled Barbie limbs. I've said it before...this parenting thing is such a catch 22. You want them to grow and learn and mature, then you long for the days they were babies. And on that note, I'm off to find Toodles..slacker!